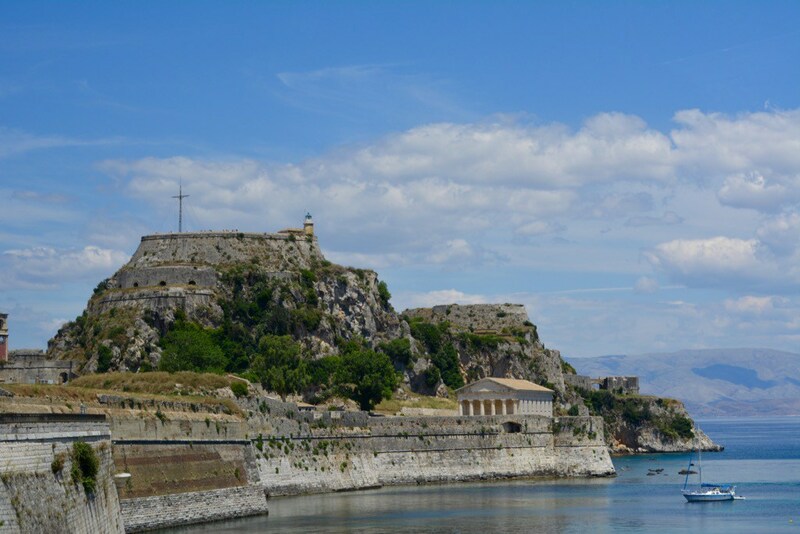 With stunning blue skies like this, who wouldn’t want to visit the island of Corfu? Going through my photos is one of my favourite past-times as it always brings back memories from my travels. And when I scanned through my Corfu inventory, I just couldn’t help but notice how amazingly beautiful this Greek island is. We spent only a day here on our recent trip in July. Yet you cannot deny that in the buildings, the colours and the landscapes there is a particular charm that is unmatched anywhere in the world. There are, of course, thousands of reasons why you should visit Corfu, but let me share with you all the things that I adore about Corfu. And while I am at it, I hope you’ll enjoy the stunning photos of Corfu that I saved from disappearing into my archives. Please, do make sure you scroll all the way to the bottom. A walk through Corfu City is surprisingly romantic. As a city that is not seeing the most prosperous times at the moment, it is alike the carefully curated decay that you would encounter in Venice. The paint may be faded, and the plaster may be crumbling here and there, yet you can still sense the elegance this city once possessed. Pride and self-confidence is evident in every corner. There is little doubt that this is a place where the arts and sciences once prospered. Rarely can you get so close to medieval fortifications that are still an impressive example of the ingenuity of the Venetians. The Palaio Frourio is a fortress like no other and can be hardly overlooked. Its design withstood three Ottoman sieges and has served a succession of different occupants. A visit to the Palaio will allow you the most marvellous views of the city and island, in particular if you visit the lighthouse. Fun Fact: The Palaio Frourio was once set for a Hollywood blockbuster, the James Bond movie “For your eyes only”. You cannot visit Greece and just ignore the fact that it is the place of origin for many aspects of modern civilisation. Yet, in Corfu other cultures are equally celebrated, and this is more than true for the Palace of St Michael and St George in the centre of Corfu City. The Asian Art exhibition in the museum is outstanding. It contains many priceless pieces from Asia including jade figurines and prehistoric bronzes. And the building itself is also worth a visit. Make sure you check out the throne room and the rotunda (the palace used to be the residence of the British High Commissioner). I recently published a post about the Corfu residence of the Empress of Austria-Hungary, Elisabeth I. She was a tragic historic figure, who spent long months in her Greek refugium to escape the pressures of the mighty Austrian court in Vienna. A rather lonely figure who was obsessed with body image and beauty. Sadly, her life was taken in an assassination where she became an accidental target. Yet, Elisabeth possessed a fine sense for the classics, which is reflected inside her beloved Achilleion as well in the sculpture garden. Visit this little gem not just to learn more about the life of Sisi but also to enjoy the sweeping views from one of the garden terraces. Corfu is a paradise for anyone who enjoys fun filled days by the beach. No matter where you look, there seems to be water everywhere – iridescent blue and inviting. There are countless beaches to choose from in Corfu, and there seems to be a beach for everyone. It is hard to say which one is the best as there are so many different beaches to choose from. Not to be missed: the famous Canal d’Amour. This is a breathtakingly beautiful stretch of coastline with deep coves and canals that are incredibly romantic. But, do make sure you visit when no-one else does or you will risk that your experience is spoilt with just a little bit too many other visitors around you. We looked forward to our visit of the Byzantine Paleokastritsa Monastery with a curious mix of awe, nervousness, and eager anticipation. Never before had we been so close to a Byzantine Monastery, and we worried about what to expect. What really happened was that we were charmed by the abundance of flowers in the Eden-like garden of the monastery. Pink bougainvilleas, grape vines heavy with fruit. The church felt strange yet familiar with many symbols similar to what we knew from our own backgrounds yet different ways of worship and art. Indigo, cobalt, royal, sapphire, turquoise – the list of colours to describe the Ionian Sea which surrounds Corfu is endless. A trip to the secluded corners of the island offers the most amazing views. There are countless romantic coves and kilometre long beaches, all boasting crystal clear water. Rocks of all sizes that are framing or protruding in such random ways that they make almost every corner of the island insanely photogenic. I didn’t realise that the Mediterranean was capable of such a play of colours, reminiscent of the South Pacific or the Caribbean. Yet Corfu is a worthy competitor in the competition of best blues. I’ve always been and always will be a lover of Greek food. Refreshing yoghurts, salty olives and fresh seafood all combine to traditional dishes that are light, flavoursome and delicious. When visiting Corfu, try some of the typical dishes. Pastitsada is a traditional Sunday meal of veal leg or shoulder and macaroni cooked in a casserole, and bourdeto is scorpion fish cooked in tomato sauce with spicy red pepper. Yum!